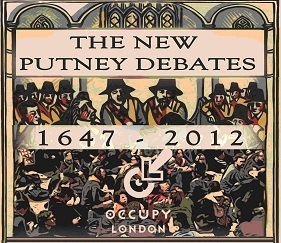 From 27 October – 11 November, Occupy London celebrates the 365th year anniversary of the original Putney Debates in 1647, by holding a series of events looking at democracy in 2012. Inspired by the Levellers and Diggers demands for social justice, civil rights and equal access to the land from back then, Occupy London’s New Putney Debates will focus on the challenges facing us now and what is needed now for a more just and equal society. Contributors include Richard Wilkinson (The Spirit Level), Natalie Bennett (new Leader of the Green Party), Michael Mansfield QC, George Monbiot, Polly Higgins, Jeremy Leggett, John McDonnell MP, Halina Ward and Professor Conor Gearty, Annette Zera, Joseph Choonara, Hilary Koob-Sassen, and many other writers, theorists, artists, and activists. Full programme at http://thenewputneydebates.wordpress.com. Facebook event is here. Throughout the New Putney Debates the emphasis will be on public participation, in the spirit of 1647 when it was said that England was “A Nation of Prophets”, with some of the events being held in the original venue – St Mary’s Church in Putney – where the Debates started on 28 October 1647. The New Putney Debates will discuss why our so called ‘democracy’ is failing us and how we can address the enormous challenges of our time, as well as learning from the past. We want to reclaim our rights too, and reclaim democracy for the people. All are welcome to participate in these historic debates. The Civil War saw our ancestors rise up against oppression by the King and feudal lords to fight for the many of the democratic rights we enjoy today. The Levellers in the New Model Army made radical demands for a more equal society with an expanded franchise, freedom of conscience & speech, equality under the law and for a sovereign parliament that obeyed the will of the people. Today our civil rights are under threat, our vote no longer seems to count and inequality is increasing. There is no evidence that the lessons have been learnt from the 2008 financial crisis and banking bailout. The needs of the ‘market’ and the banks seem to take priority over people, communities and the environment. John McDonnell MP will discussing what a real democracy would look like, and we will be asking if the time has come for a new civil rights movement.